Esteemed audio maker TASCAM has introduced the next generation of their popular line of professional grade handheld recorders, the DR-X Series. 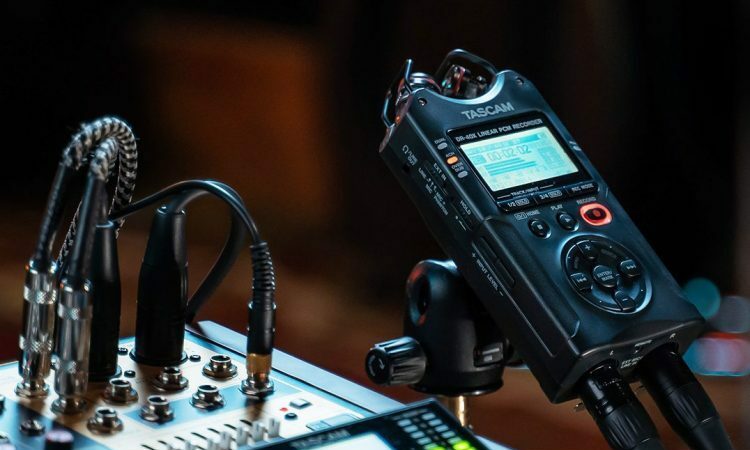 Many of you may be familiar with the Tascam DR-40 4-track portable audio recorder, and now Tascam have an updated DR-40X version, as well as two more new models in the DR-X range – the most affordable DR-05X and the DR-07X targeting musicians. Pitched as a great companion for videographers, voiceover artists, songwriters, and podcasters, the DR-40X is the top dog of the bunch with its 4-track recording ability, integrated directional stereo mics with adjustable A/B or X/Y configuration, and Dual-Neutrik XLR/1/4-inch combo inputs. The XLR inputs on the DR-40X, which will mostly be of interest to those of you reading this post, can accept balanced microphone or line level from audio mixers or the front-of-house console. The microphone preamp includes +48V phantom power and plenty of gain for detailed recordings with condenser microphones, as well as electret type microphones. Using the stereo built-in microphones, filmmakers can capture ambient sound of the audience while recording direct from an external console, which is ideal for capturing live performances. Filmmakers can also benefit from the DR-40X’s Auto-Tone function, which provides an audio cue tone identifying each recording take. Compared to the older DR-40 model, the DR-X series benefit from a backlit white display, making it much better and easier to read menus and parameters in every environment. The new DR-X Series now adds a new model, the powerful yet affordable DR-07X, designed to deliver professional performance for musicians and voiceover artists. You get the same, dual integrated, and adjustable uni-directional A/B or X/Y configurable mics as on the DR-40X model, paired with the ability to record crystal clear studio-level sound quality, the DR-07X is great for music recording, spoken word, and more. For those of you on a really tight budget, you should check out the DR-05X, the smallest and most affordable of the lineup. You get all of the DR-07X’s features minus the scalable microphones with the DR-05X. The smallest recorder in the lineup is is equipped with a pair of omnidirectional condenser mics, making it the ideal tool for recording music, meetings, dictation, and more. All DR-X models boast a totally revamped user interface, making it easy to access recording, adjusting levels, deleting takes, adding markers, and other common functions with just the click of a thumb. The recording media for all is microSDXC cards up to 128GB, enabling the DR-X Series recorders to record for extended hours. Other features include Dictation Mode, which enables the user to instantly jump back audio playback in preselected increments including speed control and a special dictation EQ, and Overwrite Mode, which allows users to select a precise Record drop-in time for replacement recording with one level of undo. 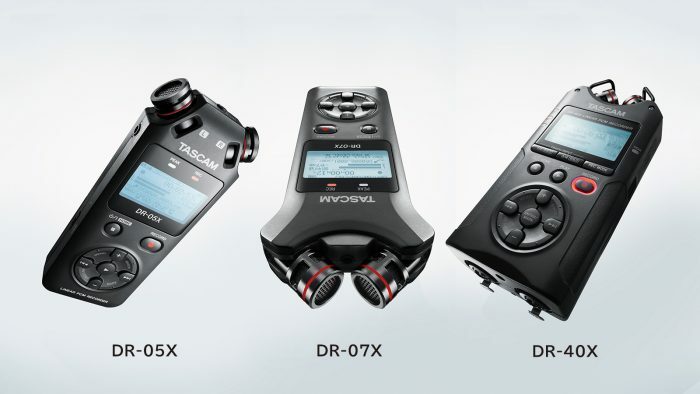 DR-X Series recorders are available now at an estimated street price of around $200 for the DR-40X, $150 US for the DR-07X, and $120 for the DR-05X. For full specs and more info head over to Tascam.